How Fast Can The Human Brain Process Images? Have you ever cursed yourself for being too slow or for your brain being a bit dull? If so, give yourself a break and prepare for a new cool fact about your brain that will ease your worries! What if I told you that your brain can process certain types of information within as little as 13 milliseconds. To put that in perspective, it takes you 300 to 400 milliseconds to blink your eye, which is 1/3 of a second. This means that your brain can identify what it’s looking at approximately 30 times faster than you can blink your eye! Scenic information in the environment hits the retina, which transfers it through electrical signals to the area of the brain that processes visual information, where it can then be interpreted. Scientists in the past thought that a rudimentary interpretation of these images to understand their general theme took at least 1/10 of a second. However, new research conducted by researchers at MIT’s Brain and Cognitive Sciences department has helped to reveal this fascinating new fact. In their study, participants were rapidly presented with a set of six or twelve images one after the other with each image being exposed for 13 to 80 milliseconds. Participants were asked to detect a picture specified by a name (e.g., smiling couple) that was given just before or immediately after the sequence. As predicted, as the exposure times decreased, participant performance of the task declined, but they could still accurately detect the majority of the time. Even at 13 milliseconds, participant responses was more than 50% accurate, suggesting that they were not just guessing. Want to try it? Look at the image below and see if a ‘car and street’ image is available. The images are changing at a speed of 200 ms which is still quite slow. However, there’s a catch. There is a small possibility that they could report the accurate description of an image because after a while, they were more skilled at detecting in short times. Also, researchers couldn’t present the images for shorter than 13 milliseconds due to technical difficulties. To prevent both these factors, further research should be conducted by flashing different images individually for shorter times to arrive at a stronger conclusion and establish an average threshold for human beings visual recognition speed. In order to remember the finer details of an image, we would definitely need more time than 13ms. More trivia? In case of information that we see, images or scene related information is processed faster than words or sentences. Different and more steps of processing are involved in reading a word which makes it longer. Take a look at the image below. Which one did you understand more quickly? How fast is our brain? Our brain has around 100 billion neurons in it. 100 Billion! That’s a lot of processing power. This lets us have responses which feel instantaneous. It takes 400-500 milliseconds (1 millisecond = 0.001 seconds) on average for us to respond to visual stimuli. If you consider that half of this time is spent in second motor signal and giving the response, the time taken to just analyze and decide on the response is really low. Neuronal activity of around 50-100 milliseconds is enough to create the information and approximately 20-30 milliseconds are required to identify and discriminate complex visual stimuli. Why can’t we calculate as fast as a Supercomputer? So now we know that our brain is really fast. But we still need computers to analyze things or perform calculations. It is said that a computer whose power is comparable to the brain could process more than 38 thousand trillion operations per second and hold about 3,584 terabytes of memory. Overwhelming, isn’t it? So much power and we can’t clear our exams properly. IBM’s BlueGene supercomputer is one of the fastest supercomputers. It has a computational capability of 92 trillion operations per second and 8 terabytes of storage. So why can’t we be that quick? Well, the difference lies in how the brain and a computer function. There can be no simple comparison between a code being executed and a neuron firing. A supercomputer, when given a particular operation, concentrates it’s computing power to figure out and complete the operation. It can dedicate its power to specific function. But where the supercomputer is still lagging behind, is having a single conscious thought. This is where our brain is different and brilliant. Our brain has multiple parallel processes to carry out at the same time. One of them is keeping us alive. It is constantly active. Since your birth and until your death, the brain works for 24 hours, keeping track of everything and coordinating everything. External stimuli received through our 5 senses is another major task. And the biggest one, keeping us self-aware. Its processing power is stretched across various functions which it cannot stop to just to perform one single function. 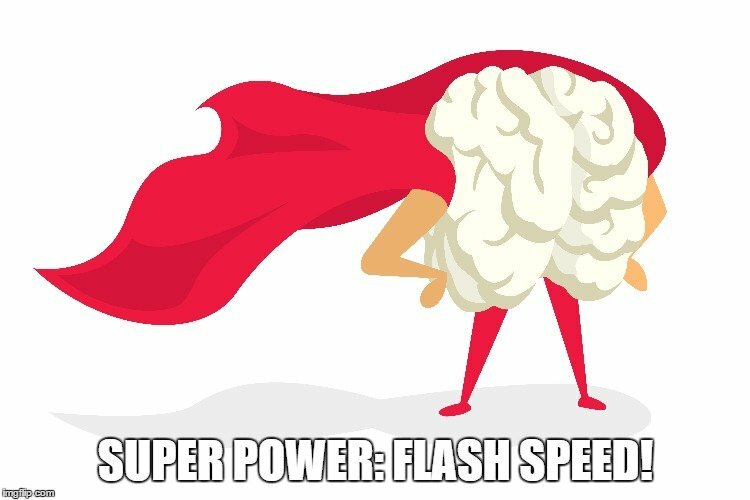 So, haven’t you always wished that you could be superhuman and process information at lightning speed? Turns out that you already can, but you simply don’t know how impressive your brain truly is. Maybe you should get practicing and flex those mental muscles a bit more often.